Although winter is seen as the most critical time for feeding birds, they do benefit from being fed all year round. In an ideal world your local environment would contain lots of natural bird food in the form of insects and seed heads, but birds can experience episodes of food shortage at any time of year, and often appreciate any supplementary food that is put out for them. Due to having a highly predatory cat, we don’t have a bird table. It would be unfair of us to lure birds to an area he could access. He doesn’t, however, climb trees so when the kids asked to feed the birds this is what we came up with. We started by making fat balls. 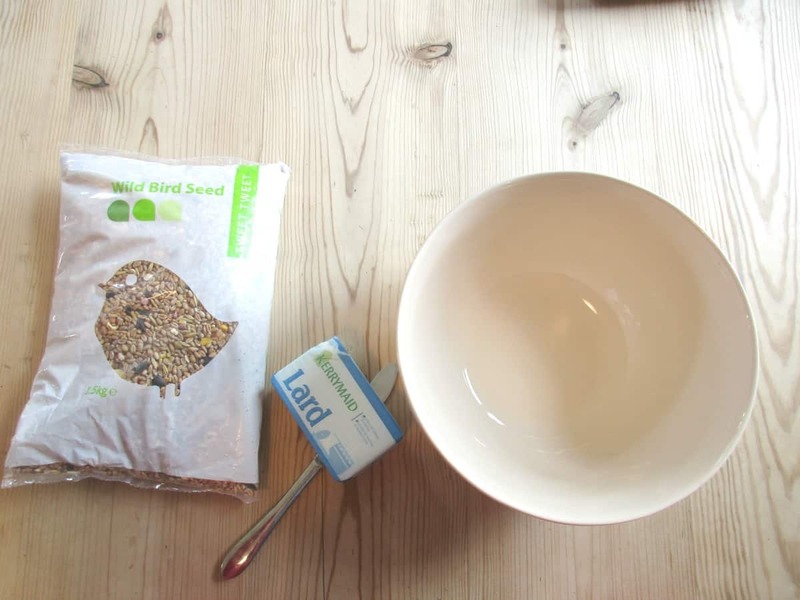 You can make these from lard or suet and a mix of seeds that are suitable for wild birds. We simply mixed our seed into softened lard, adding a little at a time until our balls held together solidly when pressed tightly, and then popped them in the fridge to firm up. The kids loved mixing up the balls; it’s great, tactile, messy play! 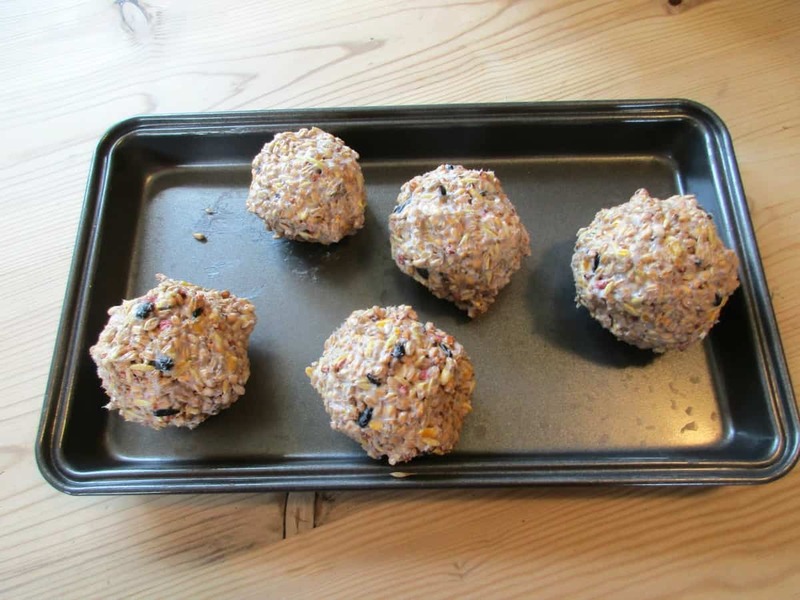 If you make a large batch of bird seed fat balls you can freeze extras until they are needed. In very warm weather, the fats can become rancid, so please bear that in mind during the summer. 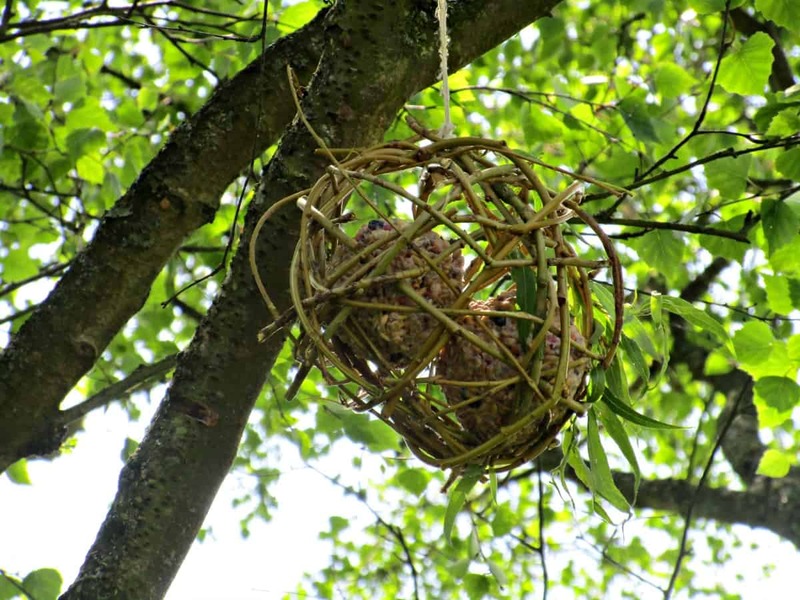 For our feeder we used our Rustic Willow Ball. 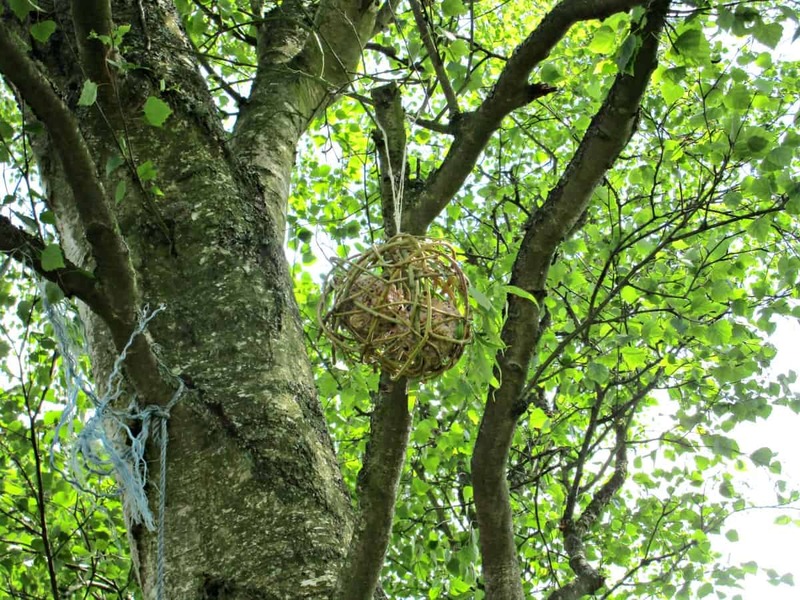 It’s perfect for the birds to hold on to, is totally bio-degradable, and can be hung up high in a tree well away from our prowling cat and other predators. Another great way to feed garden birds if you don’t have a conventional feeder, and want to feed the birds in the trees, is to fill the bark holes in tree trunks with softened suet or lard containing insects, meal worms and peanut granules. This method is appreciated by birds such as tree-creepers and woodpeckers. If you want to bring the birds in closer to your house, why not try a window bird feeder. We made ours from an old cake pan and the birds love it! 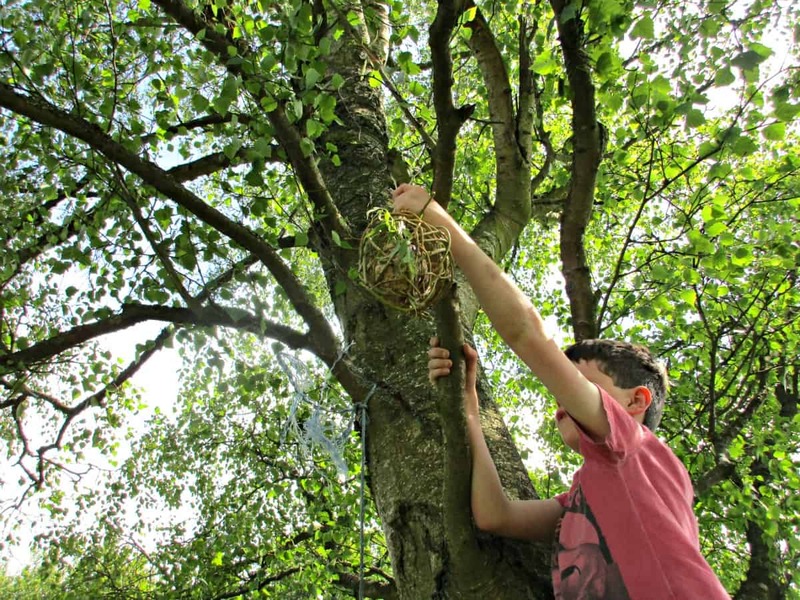 We love our rustic home made bird feeder, and think it looks fab hung high up in our tree. We’d love to know if you feed the birds in your garden, and would be especially interested in hearing how you go about doing so if you have a cat. What could I use…??? ?plastic bowl? ?…in the summer to just use seed to feed? My husband made the perfect feeder out of a 4×4 post. The top has a huge metal/glass 4compartment feeder. On each side of the post he mounted metal flower hooks/rods. On each hook we have different feeders. A Texas shaped sunflower feeder, a suet feeder, and 2 open feeders for fruit, nuts, and peanut butter balls for the Cardinals and Woodpeckers! He put a huge metal baffle on the post just below the feeders. No squirrels and no cats can get past that baffle! Wow that sounds fab Nancy – off to show my hubby your comment and pester him! Have you ever made no melt suet? Hi Sarah, This is great! My daughter would love to make these. We made some thrifty bird feeders a few years ago out of leftover milk cartons but I much prefer this as there’s no plastic involved. 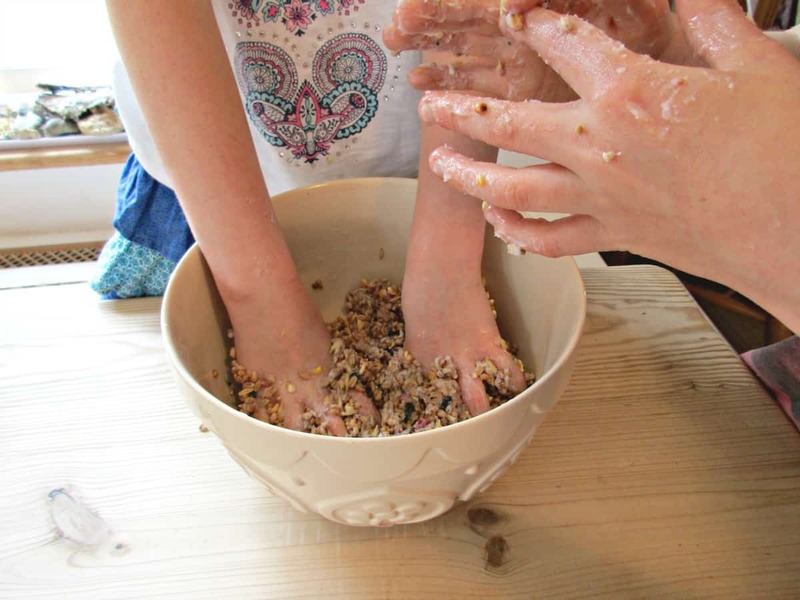 Lol yes it turned into proper messy play – the kids loved it! I have always struggled to feed the birds here for 2 reasons – we have a large dog who was tall enough to get food off the bird table we tried (and finally pushed the table over) and we have 4 cats who definitely do climb trees. Last year I tied some fat balls in the back hedge and the birds ignored them until a storm knocked them to the ground and then the swooped down and devoured the lot! We do accidentally feed them though, as they pinch our hen/duck food. Water is important too, especially in freezing or very hot weather and I often see birds at our animal water bowls. Thank you so much for adding this bird feeding post to the first #GoingGreenLinky and I hope you’ll join up again in January. I love your willow feeder. Great idea. We make suet balls too, but are lucky to only have one old cat in the neighbourhood. We’ve been putting out our homegrown sunflower heads which the birds are loving. Oh wow what an amazing idea! I never knew making these would be so simple. 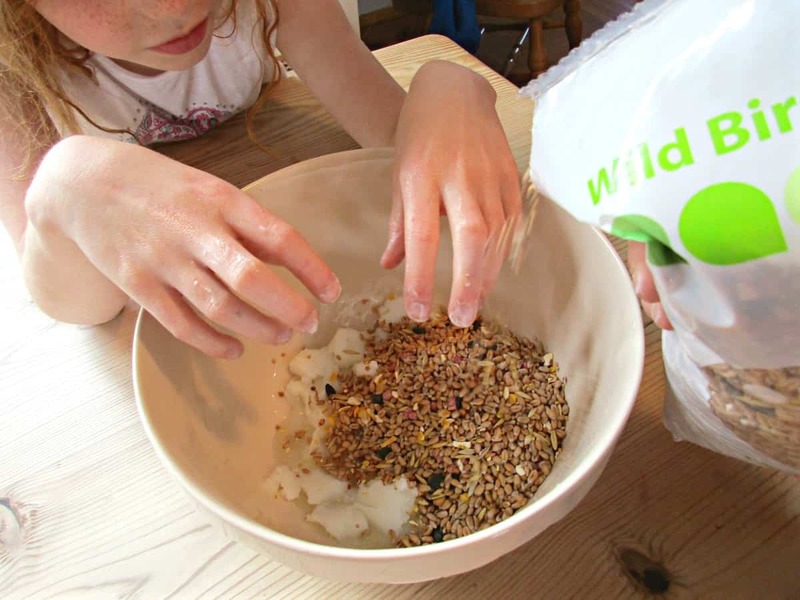 They really are simple Kat, and making them is really fun messy play for kids too – mine loved it! This is such a good idea, I’m adding it to our to do list! This is such a nice thing to do with children. It teaches them so much about the world around them. What a great idea! I love the willow balls. Great way to feed the birds. You could even use them to put string, straw, and stuff for nest building. This is not only so so pretty but such a great craft and activity for the kids! I will pin this for the summer 😉 I remember when I was a kid, that we only ever used to put out bird seeds during the winter when there was frost, but I guess that has changed throughout the years! The birds in my yard actually benefit from our bunnies food as well 😉 but I’d love to make one of these!